The Profi Press hydraulic production presses consist of an electro welded structure made out of ST-52.3 steel and are eminently suitable for forming, stamping and die-cutting / to incorporate in automatic production lines. These production presses are equipped with a mechanized lower table (made out of CK-42 stainless steel) with two ‘T’ DIN-650 grooves and a mechanized upper table (made out of CK-42 stainless steel) with two ‘T’ DIN-650 grooves. Four cylindrical, lateral rails are installed to ensure perfect alignment of the upper table. These hydraulic production presses are provided with a double acting cylinder with lapping liner, chrome plunger and anti-turning piston. The two-speed motorized hydraulic unit with automatic high speed deactivation is equipped with a cylinder decompression valve, a pressure regulator and a manometer in tons. Adjustments to the position of the upper table are controlled from a side control panel. Also the selector for the manual or (semi-)automatic operation as well as the selector for the two different cylinder speeds (fast approach speed and slow working speed) can be found on this control panel. Operation of the production presses is carried out by low voltage electrical pedals. Safety is guaranteed by level IV photoelectrical sensors situated at the front of the press and two protection panels (which can be opened) with a micro disconnection switch situated at the rear. These hydraulic production presses can be delivered with several options such as a hydraulic cushion or ejector (in upper-, lower- or both tables), NC Siemens control or the geometry adapted to your needs. 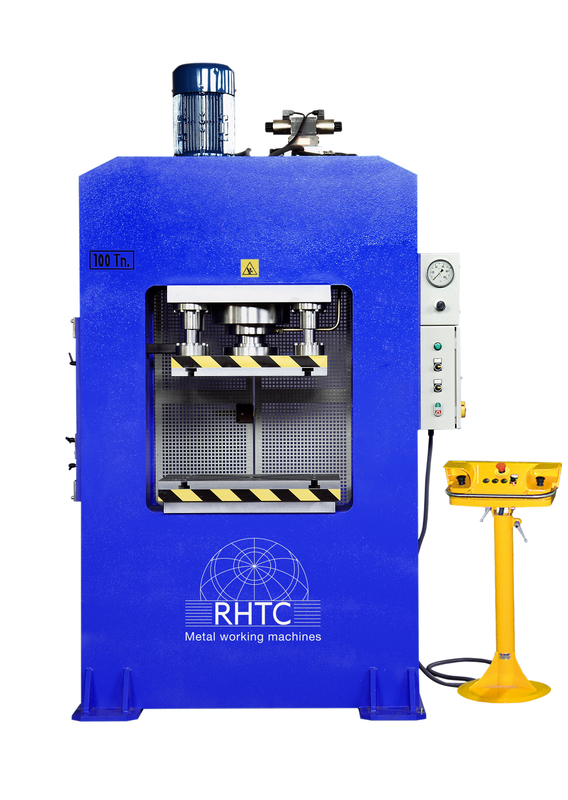 RHTC delivers these hydraulic presses with a warranty of two years. 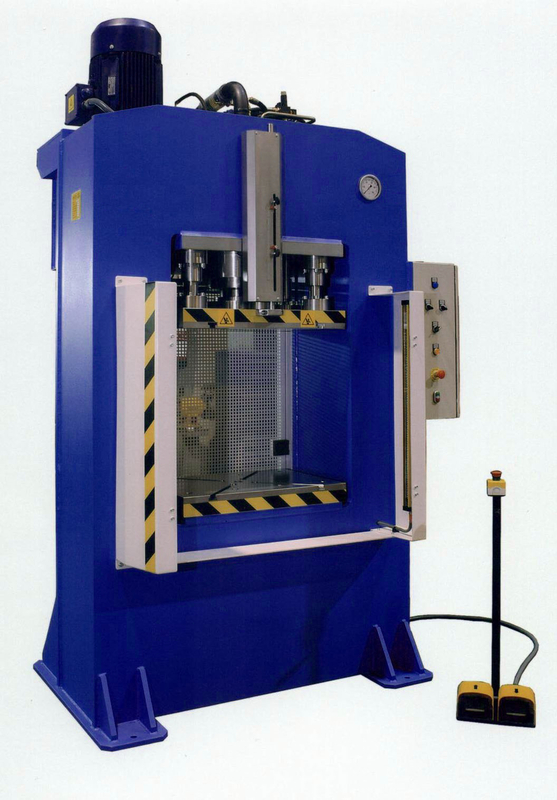 These hydraulic production presses are made in Europe and fulfil the latest CE-regulations.